Hal and all to follow! I've been working on Wombat's poozle. It's fun, as always. 2 hours in & I'm only #5? Wow! Pretty pink flower. An unusual type too! Over the years folks have referred to this shaped blossom as a bottle brush - seem to have many varieties & sizes of this shaped bloom in Australia, jacalmi! Also, greetings to this day for all who've ventured here already and those who will make an appearance later - hope it's a good one! Keith, I need your explanation for why you stated you felt that photo with a caption 'just relaxing' of the dog in a lawn chair, but sideways - why do you feel it was meant to be displayed that way? I've thought about that ever since I saw your comment last night & can't imagine any reason - help, please! Off to send Wombat my answers - always ONE word I've never heard... EVER!! Not sure if I'm right, Joyce, but I think I recognize the dog, & know that his owner is a sideways kinda guy. Morning all,some good news. Narrelle came home from hospital yesterday, still not the best but getting there. We went to see her and it was wonderful seeing her sitting in her own chair with her hubby getting her a coffee. Beautiful spring flowers every year in Western Australia. Pleased to hear the news about Narrelle, Amelia. Best wishes that she gets stronger and better as each day passes. 2:04, got myself in a bit of a tangle with that one. Good morning everyone. 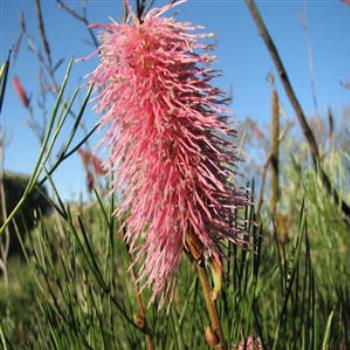 The flower in todays puzzle is not a bottlebrush. Bottlebrush grow on a shrub or small tree and not on a stem. Perhaps some of our Westralian friends can tell us what kind of flower it is. I hear no gallumping sooooooo.....Pounce! Ambles off into the distance with a smile! Vici. Sure wish she'd make an appearance now and then. I miss her. HEY HEY IT IS SUNDAY AND THIS IS A REMINDER THAT I POSTED A 3&4 POOZLE YESTERDAY. THANKS TO KATHY AND JOYCE FOR REMINDING EVERYONE. Really late today. Why? Got up before new day and left to play in a Cribbage tourney. Qualified for the playoffs tomorrow. Thus, will miss beginning of 7/16/18 day. Hoo hoo! Thanks for the flower clarification, Peter - I just know that we have a lack of those shaped blossoms here in the states! Amelia - your life has been very busy lately with new babies to cuddle and now your own 'baby' is finally home being coddled - wonderful news! I guess you've explained your comment, Keith... at least to your tongue-in-cheek satisfaction! That's exciting news, Denny - all those tournaments are starting to pay off... might it be your persistence with the challenge or do you still attribute it to 'the luck of the cards'? Have fun no matter the outcome! Amelia, that's wonderful news about Narrelle. I'm sure you'd much rather visit her at her house than the hospital. Hopefully, she can stay home for awhile. 2:26 Another slow one for me. Good morning all! West Australia is known as the Wildflower State and they do coach tours starting about this time of year. There are some really beautiful and colourful wildflowers here. Starting from the end and working backwards, remove the space between F N, the space in ha nna-ray, and the spaces and entire word More... in Callistemon, then you should be able to see the picture. Good Maen, good people. Skye is enjoying her final weekend in Norway. She went shopping in Lillestrøm, spent a long evening in Oslo then a day at the lake and is now at the Bjørneparken (Bear Park), a zoo in the Hallingdal (a central Norwegian mountain valley) in Flå in Buskerud fylke (county) northwest of Oslo. She just texted me and told me she got to feed a fox. It's been a slow day and we're still on page 1 time to do something about it!